Evolution Through Contact helped me understand that there are others who have experienced the extraordinary. The book presented such a refreshing take on the subject. Don Daniels is a credible professional who speaks of his evolutionary experience boldly for the sake of others. 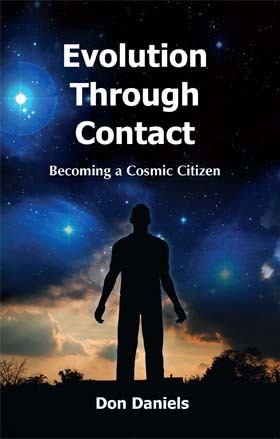 The experiences shared by the author exemplify how the universe is a mystery waiting to be discovered, and he has assumed a strong role as a proponent for the official disclosure of extraterrestrial existence. Furthermore, the experiences shared are testaments that we have much room left to grow into our role as Galactic Citizens. Evolution Through Contact is an engaging, intelligent, and thought-provoking read, which will surely challenge our thoughts on religion, government, and science. For the open-minded reader this book also serves as a compelling introduction to a far more interesting universe. Click here to enter your comments about the book.